Dramatize Co is a theatre company consisting of four actors who are training on a professional level, to create and tour pieces of theatre throughout the UK and worldwide. Our mission is to show society that as actors with learning disabilities, we are equal to able-bodied performers. Simon is a very expressive young man who thrives to tell emotion through the medium of dance. He has a very cheeky personality and his high spirits are reflected through our work. Since starting his training, Simon has appeared in the DAISY Fest, Camden Fringe Festival, Dramatize Showcase, NAS show - Autism Con, YMCA, White Lodge Performance. Holly is pure natural at dancing and doesn't stop moving her feet. She takes pride over her acting roles and likes to take centre stage in the spotlight. 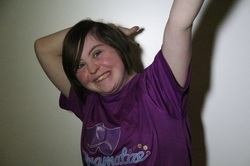 Since starting her training, Holly has appeared in DAISY Fest, Camden Fringe Festival, Harrow Disability Arts Festival, Dramatize Showcase, NAS Show, Reading Fringe Festival, International Youth Arts Festival, White Lodge Performance, YMCA, and Downs-Syndrome Association Show. Claire is the mother of the group, taking care of everyone and making sure they are behaving! Claire has grown from strength to strength building upon her confidence. Since starting her training, Claire has appeared in DAISY Fest, Camden Fringe Festival, Harrow Disability Arts Festival, Dramatize Showcase, NAS Show-Autism Con, Reading Fringe Festival, International Youth Arts Festival, White Lodge Performance, YMCA and Downs-Syndrome Association Show. 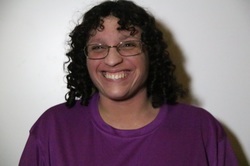 Chloe is a whirlwind of energy and has grown in professionalism within acting, becoming aware of the other cast members and working as part of an ensemble. Since starting her training, Chloe has appeared in DAISY Fest, Camden Fringe Festival, Harrow Disability Arts Festival, Dramatize Showcase, NAS Show - Autism Con, Reading Fringe Festival, International Youth Arts Festival, White Lodge Performance, YMCA and Downs-Syndrome Association Show. Have you ever repeated yourself so many times you gave up trying to make yourself heard? I did this the other day with a bus driver. I said the same words over and over again and he claimed he couldn't understand me. Another passenger kindly stepped in to interpret and finally we had a dialogue and the frustration melted away. Sometimes you need to keep trying to get your message across and sometimes, just sometimes, it's okay to accept a bit of help with that. The difficulties of communication and the importance of persevering anyway are central to Lend an Ear, a new devised show by Paper Feet Theatre and Dramatize Co. It's an idea particularly relevant to both companies, with Paper Feet seeking to make productions accessible to all, and Dramatize trying to create a level playing field for disabled performers. Lend an Ear is a short, simple but effective piece of theatre, incorporating dialogue however fundamentally relying on movement to tell the story. The collaboration works well, because with a group of seven performers, they are stronger than the sum of their parts. The individual strengths of each actor are called upon. Simon for example is an enthusiastic dancer, conveying his character's emotions best through dance. Chloe has a wonderfully expressive face, spinning us a yarn through a wide grin or unimpressed grimace. They say 93% of communication is non-verbal and you certainly know what Chloe's character is thinking without any words escaping from her mouth. Claire is an excellent narrator, reciting passages from the eponymous poem with very clear diction and good recall. It's a tough job, with Claire having limited scope to improvise. Luckily she remembers every line perfectly. As for Holly, she steals the show in her scenes with Paris, with a passion for drama that is very evident in her delivery. Supporting Simon, Chloe, Claire and Holly are Lois, Paris and Tori from Paperfeet, who attack their lines with gusto and help control the action in the scenes involving the entire ensemble. Repeated gestures help clearly establish an emotion or explain a scenario, with the busy group interactions some of the more successful scenes. As the entire ensemble shout over each other with words associated with social media, it's almost like a song made out of all the superficialities of today's text-based society. There is no live music though and given the message of Lend an Ear, I think it would be interesting to see how the performers could weave singing into this piece, perhaps with Holly taking lead vocals. Singing after all is sometimes an easier way for some people to communicate than speaking, and I would like to see this additional medium explored. Dramatize state that they seek to prove actors with learning disabilities are equal to able-bodied performers. I'm not sure they are. I mean, I'm seen some shows this Camden Fringe that aren't nearly as successful as this one, so "equal" may be downplaying what they can and do achieve. They can certainly hold their own, put it that way. I'm more than happy to lend an ear to the story they want to share and I'm intrigued to see where they go after this imaginative, comic and heartfelt production. Thoroughly enjoyable from start to finish.